I promise to use it only to send you I'm In Stitches!. Do you have a baby car seat sleepsuit for your baby? If not, then you need one! It's the perfect addition for a new babys' closet. Picture this - you're on the way home at night and baby falls asleep in the car fully clothed. You really don't want to wake them up to get their pajamas on, so what do you do? It's not really very comfy to sleep in clothes, is it? I know I don't like it. You try to keep them warm in a blanket, but they kick the blanket off as you're driving. You can't put it back in place while you're moving - chilly, unhappy baby. So - wouldn't it be useful to have this sleepsuit you could use in the car seat? Then you can transfer a happy sleeping baby right into bed if you need to, without waking them. Here's the answer - crochet this baby car seat sleepsuit, then when you're out somewhere but ready to leave, get baby into suitable sleepwear/underwear, pop them into this sleepsuit and into the car seat they go. There's even pattern instructions for a detachable hood , which can be buttoned to the sleepsuit for travelling, then you can remove it before placing baby comfortably in bed. The 2 zippers which go the full length of the baby car seat sleepsuit allow you to quickly and easily snuggle baby inside. The sleeves can be easily folded back for smaller babies, and there is plenty of space for baby to be able to wriggle little legs inside and still stay warm. 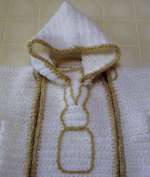 The rabbit motif has loops at the ends of the ears which double as buttonholes for attaching the hood. There are also loops at the sides of the neck to attach the back of the hood. The hood is not too large, so it won't fall over babys' eyes and frustrate them. That's happened to me too many times before! So - I've thought long and hard about this baby car seat sleepsuit and now here it is. It's worked in worsted weight/aran/8ply yarn and works up quickly. No need to use the same colors - choose a color you like. Maybe work the front panel in a different color (you'll need an extra skein if you choose this option). Any Mom would thank you for a gift like this. I wish I'd had one when mine were small! 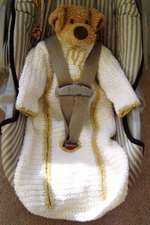 Just click the button below to order your copy of this very useful baby car seat sleepsuit pattern. NOTE: If you'd like to purchase this pattern, but have no debit card, credit card or paypal account, please contact me to arrange payment by money order. NOTE: It has been brought to my attention that the use of this type of garment in a car seat may affect coverage by car seat manufacturers in the event of an accident. Please use the finished garment at your own risk. Woolcrafting.com does not accept liability for damages caused in any accident.